This lighter version was still a hit. 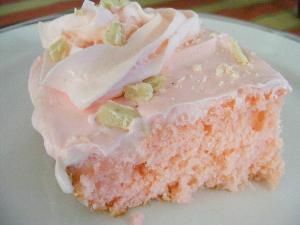 I love the combination of strawberries, white chocolate, and champagne, such a romantic cake. Would be absolutely fabulous on Valentines Day or any special date night. Preheat oven to 350 F degrees or 325 F degrees depending on type of baking dish you use (refer to back of cake box directions). Grease the bottom of your baking dish with a non stick butter flavored spray. I used a 15 inch by 11 inch glass pan. You can use a smaller cake pan if you like and adjust bake time. Mix your cake mix with sour cream, eggs, and 1 cup of champagne according to package directions, usually for about 2 to 2 1/2 minutes with a hand mixer. Poor into your greased baking dish and bake until the center bounces back to touch and a toothpick inserted in center comes out clean. While cake cools, you can prepare your pudding by mixing it with 1 cup of milk and 1/2 cup champagne & whisking for 2 minutes. Cover and leave in fridge until cake is cool. When cake is cool take the end of a wooden or plastic kitchen serving spoon and poke holes in the top of cake all over. Now spread your pudding on top of cake spreading evenly. Mix your store bought frosting with 2 tbs. of powdered sugar and 2 tbs. of champagne. Spread on top of cake and pudding.